One of my grandmas used to like to make salmon patties for dinner. They were a regular thing on nights when she’d babysit my brother and me. I can’t say that I loved them, but I thought about her as I made the Salmon Burgers from Everyday Dorie. 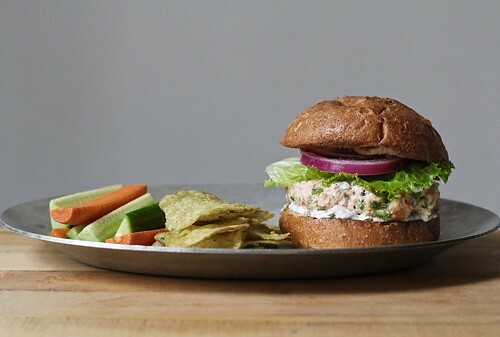 Grandma used canned salmon, but these burgers are made with fresh salmon fillets, quickly zipped in the food processor. The fish mince is mixed with a lemony, herby yogurt concoction for moisture and flavor and formed into burgers. There was a lot of chatter on the C&Cs about how well the burgers held together (or didn’t) while cooking, so I took Mardi’s advice to add a sprinkling of breadcrumbs to the mix. After chilling the burger mix in the fridge for a couple of hours, I didn’t have any problem flipping them or getting them out of my nonstick pan. The guy in this house got his burger on a bun. I had mine on a bed of lettuce instead, and ate it with a fork. Both got pickled red onions and a schmear of yogurt-herb sauce that pretty much mimicked the dressing mixed into the burgers themselves. I’d say this is an upgrade from Grandma’s canned salmon cakes, and I’d make them again. look delish! We didn’t have any ingredients in the house for doing a full burger- though Dan did talk about make brioche buns! We ended up having ours on salad and soba noodles. Quick and easy recipe indeed! Your burger looks great! I bet the salad was terrific, I made some flatbreads. Happy you enjoyed so much and that this brought back some great memories!! Looks perfect, and they were really tasty. Definitely will be using this recipe again. I like burgers with some greens too. Your burger looks both delicious and appetizing. I served mine over greens, too – it made for a lovely brunch today! That burger looks delicious with its toppings. Looks wonderful, will leave the mixture overnight in the fridge, and if needed add crumbs, the next time! Dang straight it’s an upgrade! Super tasty, even though mine fell apart. It’s good to see that another person adding panko worked so well. I could have written your post about the salmon burgers. My Mom made “salmonettes” often, using Heloise’s recipe. She used canned salmon, of course. (We lived in Iowa. fresh salmon was never available.) My burgers stayed intact, like yours. Double spatulas. Didn’t use Panko but probably will next time. Like your picture. omg- it is very possible grandma used the heloise recipe also. haha. Yours is picture perfect!! I would say these were definitely an upgrade haha! Seriously gorgeous plating and love the memory you have of your Grandma 🙂 Great job !